I know that is exciting news (or not exciting news or maybe relieving news to some of you), so I just thought I would inform everyone this way. Besides, I figure that everyone else has taken to announcing their impending joys via social media, I can announce mine here. On my blog. My girly bits, however, are apparently thoroughly convinced that I am in active labor every 20 somethings days or so and this month I honestly believe that I need an epidural to get through this day. I try not to complain. Normally I suffer in silence and just let my body do what it's gonna do. When I was in actual labor (a million years ago), I crocheted and sang my way through it. I think I did it wrong though because I ended up with a c-section and these terrible, terrible monthly anti-labor labors. This month though, there are 16 (16!) people in my Facebook newsfeed that are currently preggers with their very own bundles of baby. So, why then, must I feel like I am laboring my way through this day as I sit at my desk and write these reports and re-type these memos that my pre-laboring self screwed up yesterday? I had a c-section. My doctor has said that I will never need to go through labor ever, ever again if I stick with him (he likes to cut the ladies open, ya'll), so why, oh why, do I have to feel like this today? If I were in real labor, I could call into work and let them know that I am not working today. I am pretty sure that if I called my boss and said, "Boss, I am not coming in today. I am in labor. I am going to stay home in bed with a heating pad and bad rom-coms to keep me company. Later, the Hubs will be me some kind of ice cream. I will see you tomorrow." that he would say something along the lines of, "I wasn't aware that you are pregnant." And then I would have to tell him that I am not pregnant. He would probably tell me to come on into work, which is why this is the better way to make this announcement, to kill all the birds and all that jazz. I would like to start myself a gift registry. The monthly anti-labor labor that I am going through is very expensive what with the ice cream, heating pad, Midol, girl products, and copious amounts of frozen easy meals that my family is forced to eat on this day each month. Not to mention the copy of Hope Floats that I must have to get through the really bad parts. Someone remind me of this day when it gets close to payday. I am gonna need to stock up on supplies for next month, and I always seem to forget these things until I already writhing in pain and ready to give up and broke. 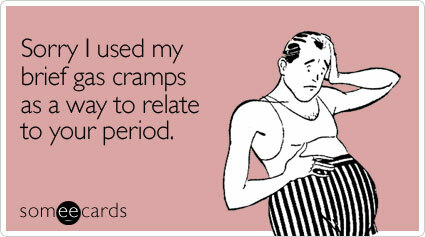 Sometimes I have cramps so bad I cry. I know exactly what you mean. Funny post - even though it is about something NOT funny.